Guns 4 Hire is a new Windows Phone 8 game that landed in the Store the other day and calls for you to tackle a wide assortment of missions against ruthless dictators, warlords and terrorists in general. Game play is a little like a mobile tower defense. Instead of planting stationary defense towers that defend against enemy attacks, you control a squad of four soldiers, each with unique skills, that takes the fight to the enemy. Graphic are nice, game play challenging and with 18 missions and several side objects, Guns 4 Hire won't get stale too quickly. Missions mostly include seek and destroy type objectives but there are missions to repair or defend posts. Along the way you earn cash that can be used to buy equipment and character upgrades in between missions. Game controls are rather simple, tap the area of the screen you want your team to move to and they shoot up any enemies that come into sight. You can move the crew independently or collectively. Along the left side of the screen are controls to heal your crew with health packs that can be purchase or discovered during missions and controls to use a few bonus weapons as you battle the angry hordes (grenades, land mines, and automatic turret machine guns). You can continue to play if one or more of your team members goes down but, obviously, if all go down the mission is a failure. You'll just need to heal them before you can tackle more missions by purchasing more health packs. Not enough cash on hand to buy the health packs? Guns 4 Hire has the option for in-game purchases of diamond or cash that can be used for health packs, upgrades and equipment purchases. You can spend $46.99 and get $5,000,000 in cash or as little as $1.29 for $20,000. Special offers pop up on specialty items and attributes as well. 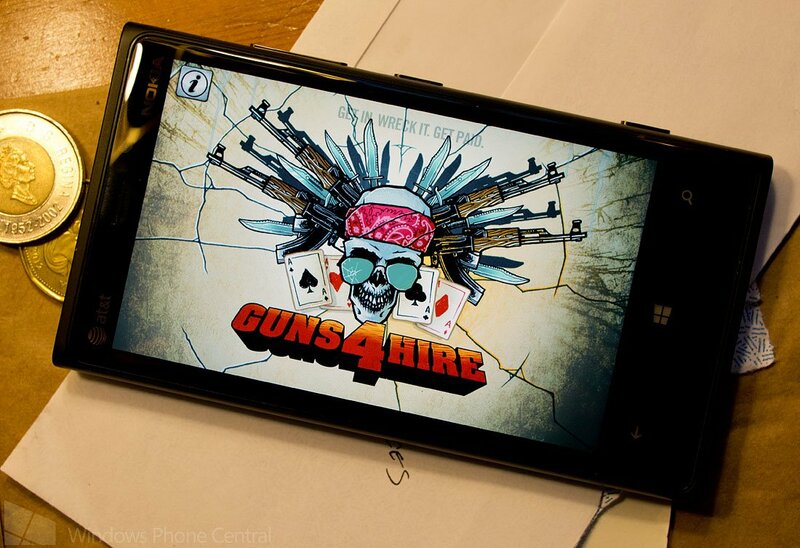 All in all, Guns 4 Hire is a nice addition to the Windows Phone 8 gaming library. It's a free game and you can find Guns 4 Hire here in the Windows Phone Store. Thanks, messi, for the tip!